Strengthen security at your branch. Enhance security at your branch by replacing standard mechanical locks with convenient and secure electronic locks. Your cash drawer, safe chest, teller locker and undercounter equipment can all be upgraded. Replacing most standard mechanical locks, electronic locks provides additional security by eliminating combination manipulation and temporarily shutting down the lock until the correct combination is entered. 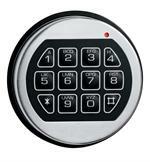 Electronic locks are convenient, eliminating the need to bend down and spin the combination lock. 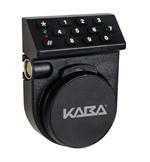 The number keypad allows access in seconds. Why upgrade to an electronic lock? Learn more about the top seven reasons to upgrade from a mechanical combination lock to an electrical combination lock. Download our promotional handout for this product. Talk to your technician today about any specials or promotions he may have. Request your free quote today to upgrade your locks. 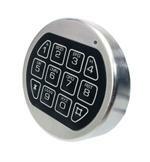 The Auditcon lock is designed to combine the convenience of an electronic lock with enhanced security. Electronic combination locks allow users to maintain their current level of security, improve the user experience and modernize the appearance of the facility. These locks reduce the need of bending over to see the dial to line up the numbers and reduce the amount of time required to enter the combination. These benefits combined with the enhanced audit functionality of the Auditcon lock offer a great balance between convenience and security. The ComboGuard Pro lock is designed to combine the convenience of an electronic combination lock with enhanced security. Electronic combination locks allow users to maintain their current level of security, improve the user experience and modernize the appearance of the facility. These locks reduce the need for bending over to see the dial to line up the numbers and reduce the amount of time required to ener the combination. These benefites combined with the sesquential audit functionality of the ComboGard Pro lock offers a good balance beteen convenience and security. The LG Basic Electronic lock is designed to offer the convenience of an electronic combination lock. Electronic combination locks allow users to maintain their current level of security, improve the user experience and modernize the appearance of the facility. These locks reduce the need of bending over to see the dial to line up the numbers and reduce the amount of time required to enter the combination.